It’s January 1, 2013 and the New Year has started. Watching the Bowl games, eating the black eyed peas and greens and taking down the Christmas tree. 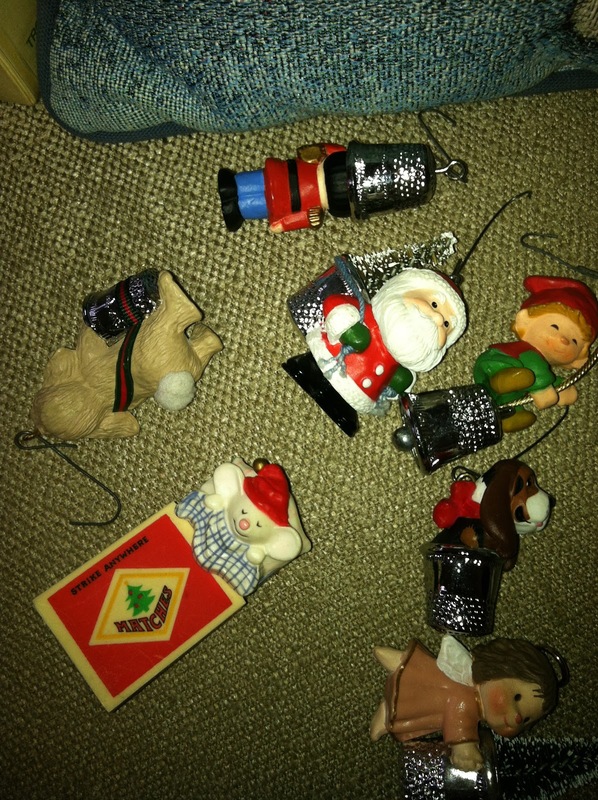 As I took down my tree today I had the best time with the ornaments that I had put up just 3-4 weeks earlier. I wanted to share some of those stories with you, because each of my ornaments usually has a story and it’s special because of the relationship I share with someone. 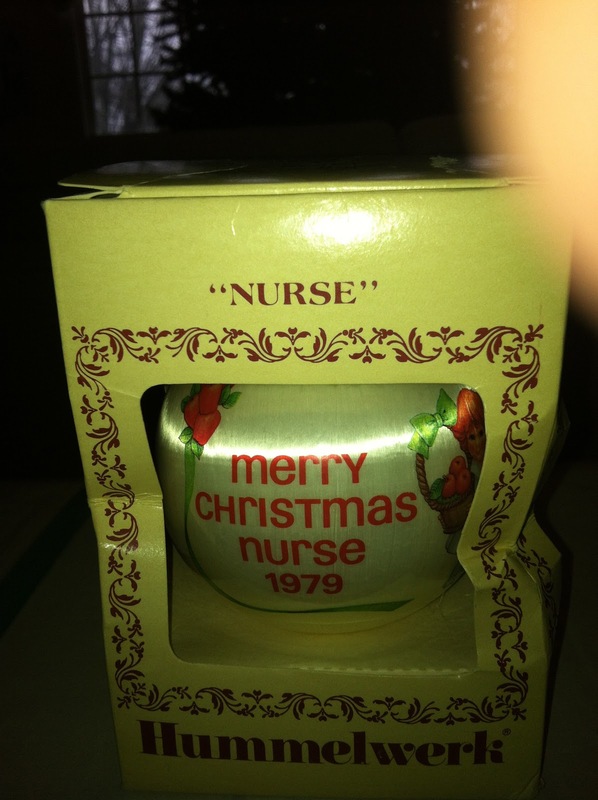 The ornament just brings back those memories. I’m very meticulous how I put my ornaments away each year. These are some of my prized ones. The ones on the couch that are needlepoint, were made for me by my sweet great aunt in 1978 for my first wedding gift. I showed her that I had kept them for twenty years and she laughed thinking they were not very much. I think about the time she put into them, and that she cared enough to do that for me. She is long gone now, so I definitely treasure them and think of her every Christmas. When my first marriage was strong, I had two little dogs that I loved so much Frankie and Baron, they were like my babies. When my first husband left me and I had two small children, I had lost Frankie and one day as I was driving down the road I saw a little dog that looked just like Frankie. I picked her up and took her home, tried to find the owner but to no avail. It was kind of like we found each other. She was great comfort to me when I went through the trials. Family pets are so much a part of the dynamics of the family and add wonderful memories. Such as Hoss, who was my son’s dog. He got him for his tenth birthday from one of his best friends’ dogs’ litter. He was such a neat dog that was so easy to be around. We lost him this year. Trevor puts this one up and remembers that little fluffy dog. We all miss him and look for him to come into the den to sit on our lap. Now John and I will wait to see what dog will come into our life like Schoeny did and Frankie, and Baron and Hoss. You just know when a dog is right. Years ago when I was still in California working on the Pediatric Oncology unit, supporting my first husband and myself, my dad came to visit. I remember taking him back to the airport and we had a little extra time so he went into the stores with me. I saw this little ornament and he bought it for me. My Dad died four years ago. He did not like Christmas at all and did not give me many gifts that were actually from him. So this is very special to me, I think of that special day where he took the time to be with me and buy me this little ornament. I do miss him so very much. Daddy’s are so important to little girls. During that phase of my life, I was the main bread winner. My husband studied very hard and I did not expect him to work while he went to school. But that made the finances a little tough. 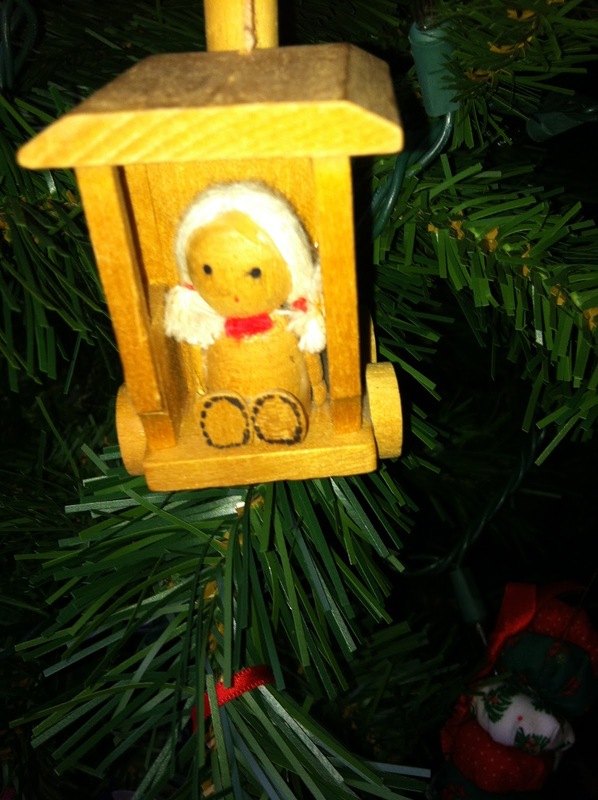 This little ornament on the left was from my very first Christmas on our own. I got it at a store called “Pic n Save” and I got each ornament for about fifty cents. I like to remember those simpler times and that we can create memories and money is not what will make us happy. This one on the Left was one I have recently gotten while John and I were in Williamsburg. As you can probably see from previous pictures, Williamsburg is one of our favorite places to go. 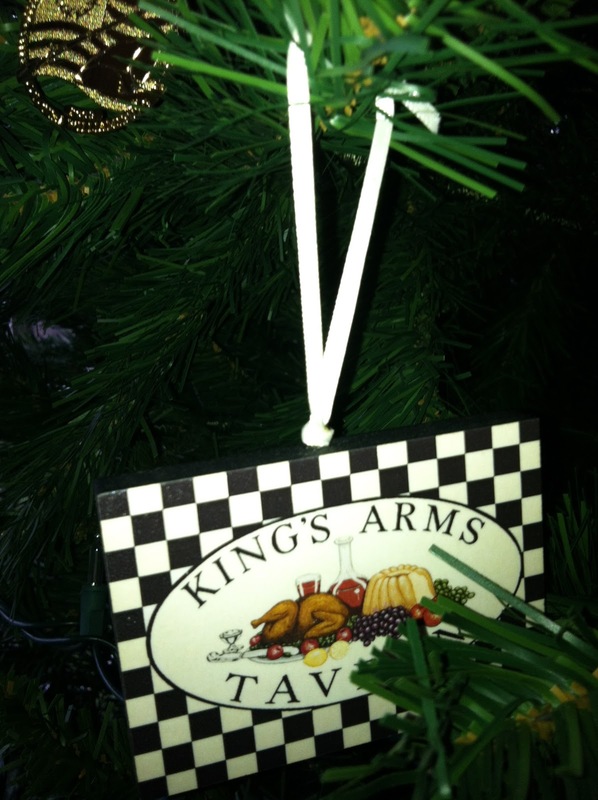 The Kings Arms Tavern is John’s absolute favorite place to eat. When I put this up it takes me to those nights we would go to eat there and the specialness of those visits. On the right are the little Hallmark ornaments that make me think of my best friend. See that little Angel with the thimble at the bottom right? She gave that to me one year for a Christmas gift. I love to sew and create so this was definitely an expression of me. 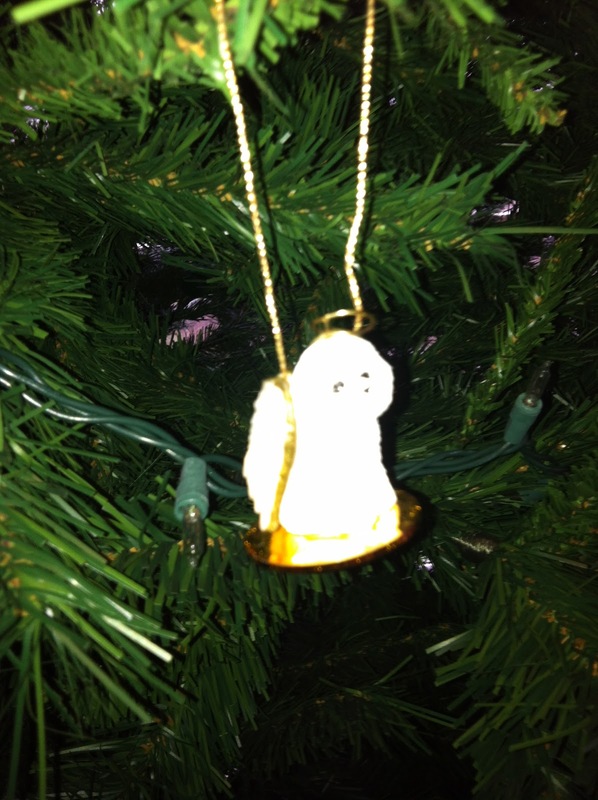 I collected the whole series, but I think of her every year when I put them on the tree. John shared with me today that this is one of his favorites. This one is a very recent one. It is from my mom. Very special when she picks things out. I love her taste and love how she has brought such wonderful traditions of Christmas to our family. She loves to find her daughters special gifts. So I love to look at this and think of her. I want to end with this very special one. It brings a painful memory, but one I don’t want to forget. This one actually came from my daughter. When she was about eight years old she wanted to get me a gift for Christmas so she asked someone to take her to the dollar store. She only had about $1 so she knew I loved my Christmas ornaments so she got this one for me. 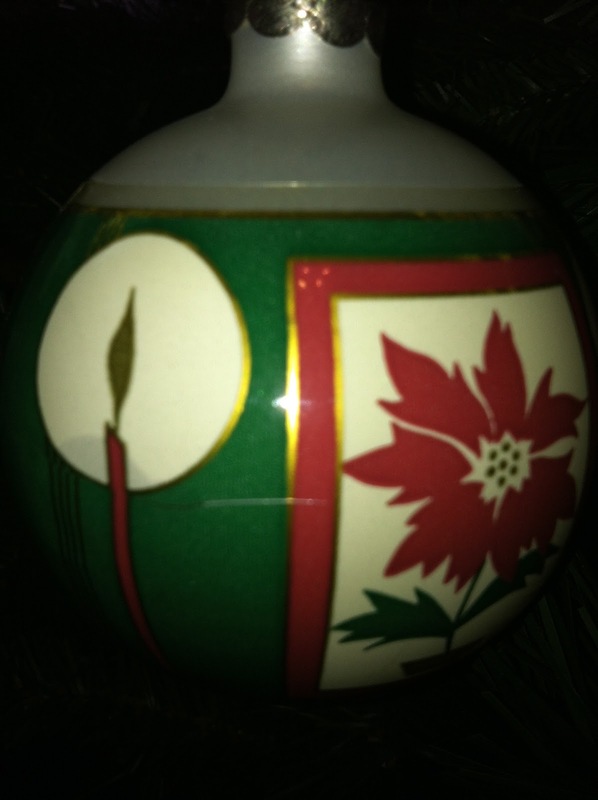 She shared with me later that the person told her that it was the ugliest ornament that they had ever seen. That hurt her so badly. I keep this to remind me of that painful time for her and that she didn’t ask for the division and she wanted to just have a normal family. It doesn’t matter what it looks like, when it’s given in love. I want to remember to be sensitive to a child’s need to feel accepted and remember to take another single mom’s child out to shop at Christmas. It’s the little things that make the memories. Well the year has ended and I’ve put my Christmas away until next year. My memories are all safe, I’ve shed a couple of tears and treasure those relationships that i have represented on my tree. The new is here but we keep the old to remind us of some very special times. We also want to learn from those memories, so we don’t repeat what has been done in the past. We want to remember the hard times and the good so that we choose to move forward and enjoy life. It’s through the hard times that we grow. And because life is all about relationships isn’t it? AWESOME! 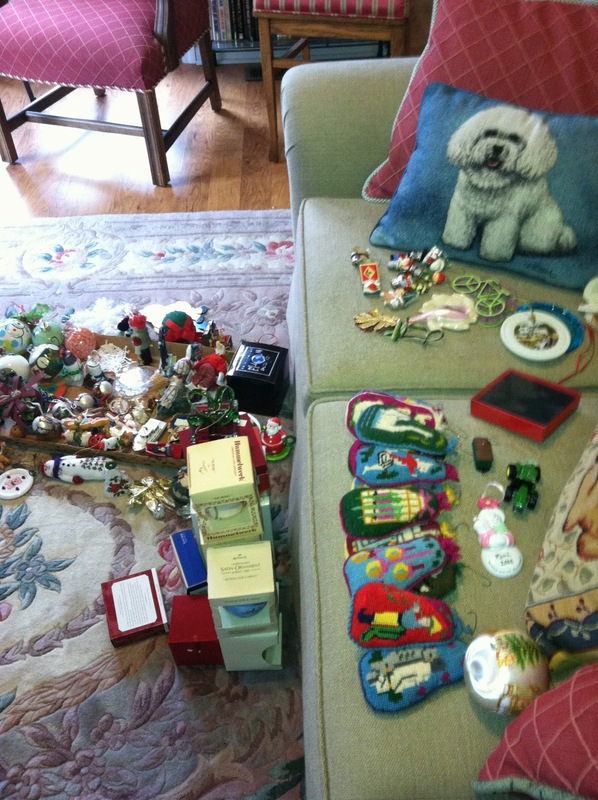 All of those ornaments tell a story, and that’s the fun of it. 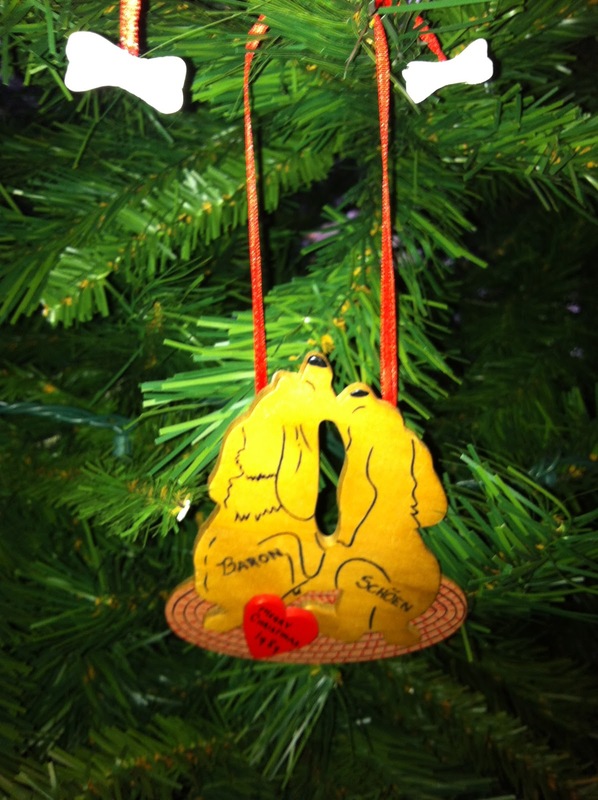 I really like all our ornaments and what story they tell. Great post!